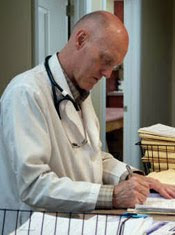 Dr. David B. Jack is my primary care physician. I was referred to doctor Jack by my previous doctor because of his special expertise in weight management. He his experienced in working with morbidly obese patience. That experience is invaluable to me. Anyone who has ever been to a doctor who doesn't have that experience is bound for frustration and a poor diagnosis (i had a couple bad experiences). Dr. Jack is on a tour of duty in Afghanistan right now so I am meeting with one of the other doctors in his office for my pre-surgery workup. It's mostly labs. For more info on Dr. jack and his practice, click here.